Iraqi man walks past a campaign poster for Shiite Dawa Party reading in Arabic "Oh, Hussein, here we come to your aid," in Baghdad, Iraq, on Feb. 16. 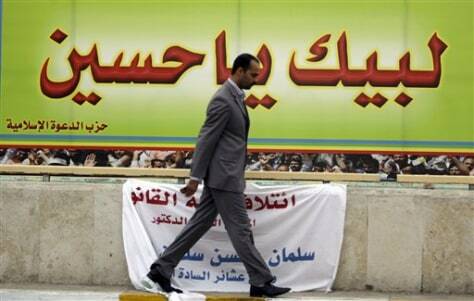 Election campaigning is only stoking Iraq's political tensions. Thousands of campaign posters and banners around the city play to potentially explosive sectarian resentments, with Shiites pointing to Sunnis as loyal to Saddam Hussein or al-Qaida and Sunnis depicting Shiites as oppressing their community.